This week has been a whirlwind of emotions. Monday morning I woke up at 3am very nauseous and feeling really weird. I threw up and threw up and shortly after had some intense pressure waves (contractions). I also had some extreme lightning bolt type pain through my pelvis, lots of pressure and excruciating back pain. I was sure this was the onset of my ‘birthing time’ (labor). I called the midwife and she told me all the signs pointed toward GO but I needed to time my pressure waves, take a warm bath, drink water and see if I still progressed. After I got out of the bath I noticed the pressure waves dwindling and finally laid down and before I knew it I had fallen asleep from exhaustion. I woke up and the pressure waves had completely gone and I felt defeated, sad and unsure. I had given so much of my focus and hard work during the false labor and had gotten so excited that I would finally be meeting you. I called into work to let them know that there was no way I could come in after all of that and your Dad called in too so he could stay with me. We took another early morning nap and when I woke up I felt the strong urge to walk. I don’t know where I got that burst of energy but that’s all I wanted to do. So we went to the local park and power walked about 2 miles in the hot sun. We came home, ate lunch and then got ready for my Midwife appointment that had already been scheduled. I was so hopeful that after all that hard work that I must be a little bit dilated. She checked me and nope, not dilated at all. I almost wept. So silly, I realize but I was sure I would just be a tad dilated. I was a little bit effaced though and that made me feel better. She checked to see if she was head down and was nearly sure she was but not 100% certain. I voiced my concern that it had felt like you had flipped or moved into a higher position because since 32 weeks you dropped really low but the past few days you have seemed to be up so very high. So she suggested an ordered ultrasound just to check and make sure you were not breach. Just her saying that made my stomach turn and I instantly agreed just so that I could have the peace of mind. So this morning your Daddy and I went for the ultrasound and she checked all your organs and measured your bones and checked your position. Sure enough, you were head down and I sighed a huge breath of relief. 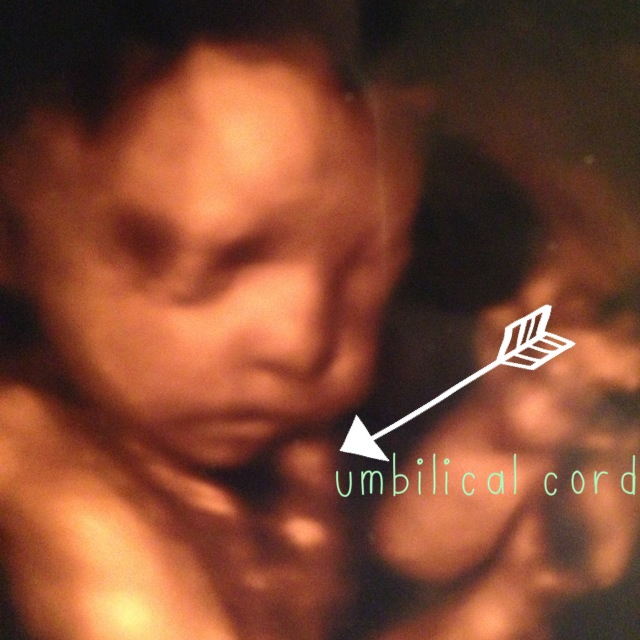 When we went in for your 4D ultrasound at 30 weeks we discovered that the umbilical cord was lassoed around your neck. This was unnerving to see and I asked the Midwives if there was anything we could do. Unfortunately, there is nothing that can be done while in utero but she assured me that this is quite common and most of the time they simply just unwrap the cord as they are delivered. I didn’t let this stress me out but it has lingered in my mind since and I have prayed that you would remain safe and healthy. So today, as she was conducting the ultrasound I asked if there was any way she could check to see if the cord was still wrapped around your neck and she surprised us by agreeing that she could and she switched to the 4D ultrasound. Thankfully, she said the umbilical cord was no longer wrapped around your neck but floating in front of your face. Once again, I breathed a huge sigh of relief! I was even more surprised that she got a terrific angle of your sweet squished face! I really had no idea we would be able to see you because you were head down and facing my back. Let me tell you, I have never been so tickled in all my life! It was such a pleasant surprise and treat especially after my disappointment from earlier this week. We oohed and awed and giggled over your AMAZING, to die for chubby cheeks. There is NOTHING better than chubby baby cheeks and I was really hoping that you would inherit them from your Daddy and I. 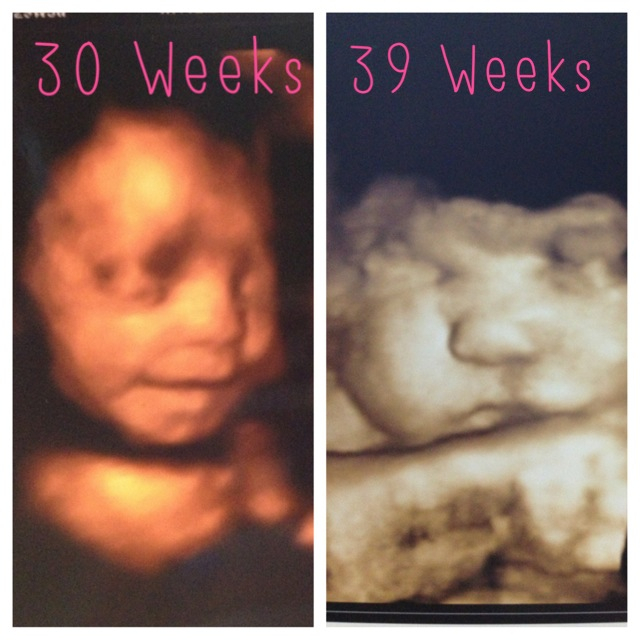 Here you are at 39 weeks and 4 days- just 3 days away from your due date! 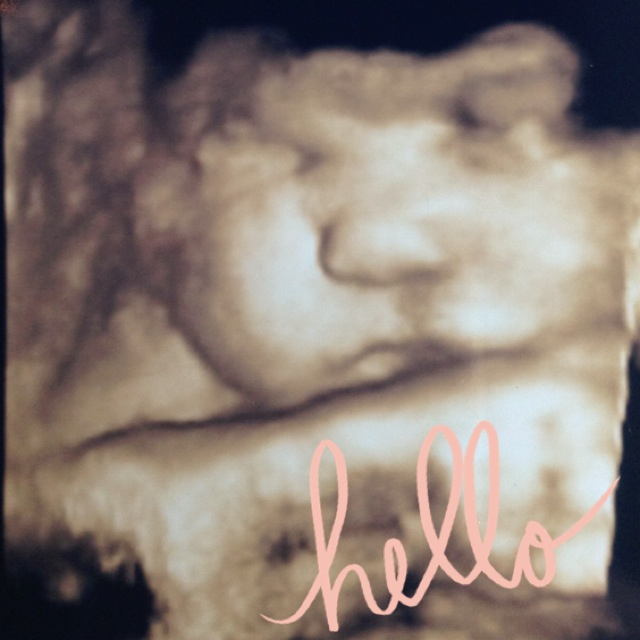 The ultrasound tech also let us know that you have a head full of hair so we better get our bows ready. I failed to tell her that I already have a variety packed in your hospital bag ready to go. My Dad thought the black shadow around your head was your hair and I laughed and let him know that was just where the picture cut off because the rest of your head was too far into my pelvis to capture. If that was your hair I would laugh hysterically because it looks like an Elvis wig! Mom was concerned about the photo of you sucking your thumb because she though your eye looked like a frog eye and again we laughed. That is just the distortion of the ultrasound from where you were moving while they took the photo. I absolutely love that you were sucking your thumb and you really remind me of my sister, your Aunt Whinnie. Everyone is so smitten over how beautiful and cute you are…get ready for lots of cheek pinchers coming your way! I can not even express how smitten I am. Seeing your sweet, chubby face was exactly what I needed to get through this week and gives me something to focus on as I try to patiently await your arrival. As I was getting my hair trimmed today, Amanda my hair dresser & friend brought up a great point. She reminded me that Monday night, although disappointing, might just be God’s way of giving my body and mind a final dress rehearsal. That totally clicked and made sense to me and even though I am a bit disappointed you aren’t here to cuddle with, I am blessed that I got a chance to prepare myself for what’s to come. And when I look back on it, I am pretty proud at how I did and how calm and relaxed I remained. It gives me hope that I can really do Hypnobirthing and have a safe, quick and easy birthing. So my little chubby cheeked cherub, I will cherish the very few moments, movements & hiccups I feel inside of me because I know I will miss them and feel empty without you in there. 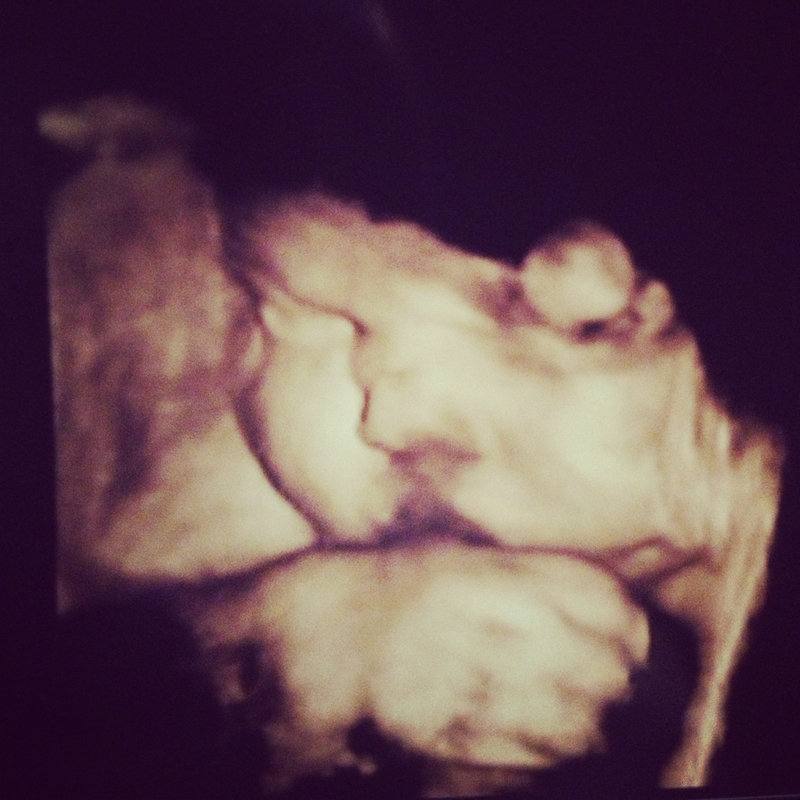 I will feel good that you will never be more safe and cared for than you are now in my womb. I will take joy in the anticipation of awaiting your arrival and gawk at your chubby cheeks a thousand more times before I get to see, kiss and squeeze them on this side of the world.